My latest full-length play The Sweeter the Crime has been selected for a workshop and a series of readings with Renaissance Theaterworks in Milwaukee. 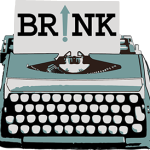 The BR!NK award “is presented annually to Midwestern female playwrights to develop and advance their work.” I am one of two playwrights chosen this year; I’ll be spending a week there workshopping the play in August and will return in September for the readings. The full announcement is here.